Save 10% on every purchase! Ends Monday, April 22. Frame size: 15.8 x 19.7 inches / 40 x 50 cm. Frame size: 13.2 x 23.4 inches / 33.5 x 60 cm. By Charles Kaufman. Paper size: 13 x 19 inches. 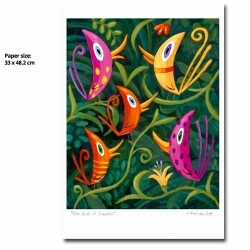 Cute and colorful birds singing and having fun in the jungle paradise.Every Giclée-Print is handsigned, titled and dated on the front. Printed with high quality pigment inks on fine art matte paper. We ship worldwide.Shipping costs here. 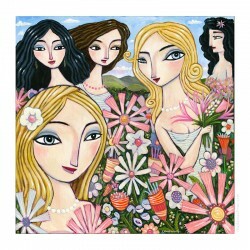 Giclée Print on Canvas: "Flowers in a Room"
"Flowers in a Room" by Charles Kaufman. Limited edition of 99 prints. 100 x 100 cm / 39.6 x 39.6 inches Giclée Print on Canvas. We ship worldwide.Shipping costs here. 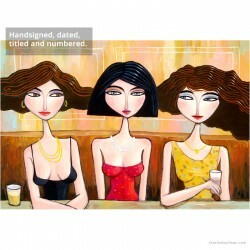 Limited edition of 99 Giclée prints on canvas. 70 x 75 cm / 27,6 x 29,5 inchesEvery Giclée-Print is handsigned, numbered and dated on the front & back.Certificate of Authenticity. We ship worldwide.Shipping costs here. by Charles Kaufman. Limited edition of 99 prints. 90 x 100 cm / 35.4 x 39.6 inches.Giclée Print on Canvas. Prints are produced by the artist in his studio. We ship worldwide.Shipping costs here. By John Kaufman. (Uncle of Charles Kaufman)Paper size: 13 x 19 inches.Printed with high quality pigment inks on fine art matte paper. We ship worldwide.Shipping costs here. 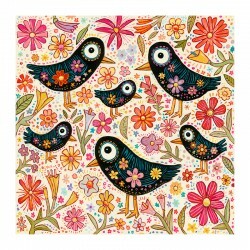 3D Graphic: "Birds and Flowers"
3D Art Construction Graphic by Charles Kaufman Frame size: 15.8 x 15.8 inches/ 40 x 40 cm. Art size: 10.2 x 10.2 inches / 26 x 26 cm.Limited edition of 99. Hand signed, dated, numbered, titled. Comes with a Certificate of Authenticity. We ship worldwide.Shipping costs here. 220,00 €	Framed & ready to hang on your wall! 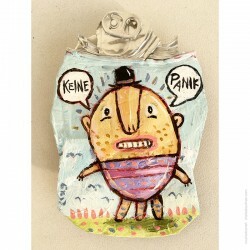 Crushed Can Art: "Keine Panik!" by Charles KaufmanEach Crushed Can Art object is made from a recycled, flattened soda or beer can.The can is crushed flat, painted, given two coats of varnish and then mounted behind protective glass in a custom, white wooden frame.Only one available! We ship worldwide.Shipping costs here. Framed & ready to hang on your wall! 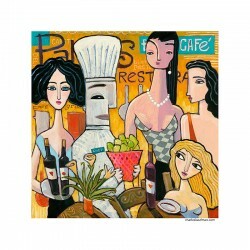 3D Graphic: "In the Restaurant"
By Charles Kaufman. Paper size: 13 x 19 inches.Every Giclée-Print is handsigned, titled and dated on the front. 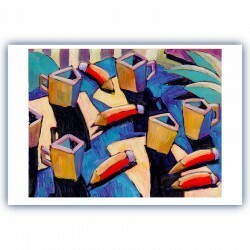 Printed with high quality pigment inks on fine art matte paper. We ship worldwide.Shipping costs here. by Charles Kaufman. Limited edition of 49 prints. 100 x 100 cm / 39.6 x 39.6 inches Giclée Print on Canvas. 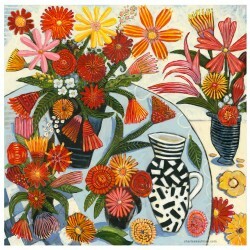 Prints are produced by the artist in his studio. We ship worldwide.Shipping costs here. by Charles Kaufman. Limited edition of 199 prints. 80 x 120 cm / 31.5 x 47.2 inchesGiclée Print on Canvas. We ship worldwide.Shipping costs here. Welcome to the Back Wall Art Store! 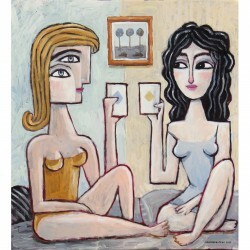 An online-shop for art by Charles Kaufman. You are purchasing direct from the artist. 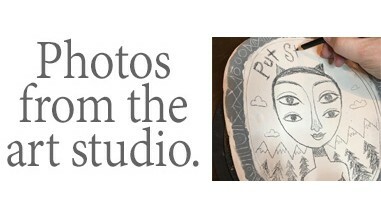 Want a special painting or sculpture created for you? I also do commissioned paintings and sculptures. Please contact me for more information. Charles Kaufman is an American artist with art studios in the U.S. and Germany. 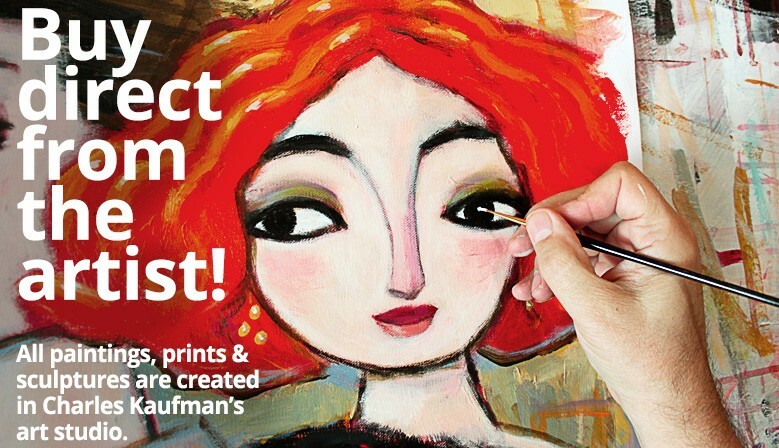 After many years of creating freelance cartoons & illustrations plus working as the ad agency Creative Director, Kaufman picked up the paintbrush to start painting. He has been painting and exhibiting his work fulltime since 1995. United States and in Europe. Charles Kaufman´s creative work has been in over 100 publications around the world. He has illustrated and written several books including his recent collection of women paintings titled, "Sketches","Five Hundred and Forty Women", "Detail Views", "The Land of the Giant Toasters" and "The First Collection of Fred and Frank comics". 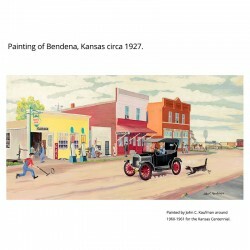 Charles Kaufman's colorful paintings and other art is in collections worldwide. Read more about Charles Kaufman here.